Fantasyland is based on Disney's classic animated films and is the place where children of all ages can step right into a fairy tale. What fairy tale would be complete without a castle? Cinderella Castle is the gateway into this land and its walls stretch across Fantasyland separating it from the rest of the Magic Kingdom. Here, anything is possible. 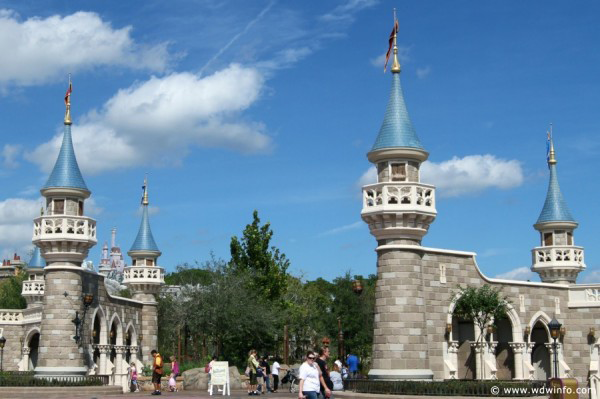 The attractions in Fantasyland take you back to your childhood. Experience such classics as "it's a small world", Peter Pan's Flight, The Many Adventures of Winnie the Pooh, The Mad Tea Party and the 3D film, Mickey's PhilharMagic. If you're hungry, grab a bite to eat at Pinocchio's Village Haus, Storybook Treats, or the Cheshire Cafe. Like other areas of the Disney theme parks, Fantasyland will have its own live entertainment experiences. The Royal Majesty Makers are just one of the new groups. The group are "royal consultants", teaching children the skills to become princes and princesses. Retired knight Sir Sterling, royal etiquette teacher Lady Llewellyn, squire Tobias and lady-in-waiting Bridget will conduct Knight School, deliver invites to the ball, lead dances and play games. The Storybook Circus Giggle Gang is a group of clowns set out to entertain the guests with their wild shenanigans. Music will be provided by the Silly Saxtet, showing off their unique skills, and featuring Wowzer the clown and his amazing stunts. Chuckles Buffoon McMonkeyshine III and his proteges, Whinny Horselaugh and Snort, will bring the whole area to life! Storybook Circus features a re-themed Barnstormer featuring Goofy as the Great Goofini, Dumbo the Flying Elephant, complete with interactive queue, and the Fantasyland Station on the Walt Disney World Railroad. Casey Jr. Soak 'N' Splash Station is the place to take the kids when they need to cool off. Head to Big Top Souvenirs to get your Storybook Circus merchandise. A unique feature of this location is Big Top Treats, a show kitchen making cotton candy, caramel apples, Goofy's Glaciers drinks and more! Seven Dwarfs Mine Train – This is a family-friendly roller coaster that brings guests on a musical journey into the dwarfs’ diamond mine! Under the Sea ~ Journey of the Little Mermaid – Ariel and her friends take guests along on all their adventures – both under the sea and above! Be Our Guest Restaurant – This restaurant serves 550 guests in the stunning ballroom, the mysterious West Wing of the Beast’s castle, or the elegant Rose Gallery, with counter service available during the day, and table service at night. Belle’s Village – Guests can visit Gaston’s Tavern, created to look like the tavern from Beauty and the Beast or Bonjour! Village Gifts for souvenirs. Step outside of the village and you will see Belle’s cottage. Enchanted Tales with Belle – A new interactive character meet-and-greet location for Belle and Lumiere, guests start in Maurice’s workshop, where they step through a magical mirror straight into the Beast’s library.